Oh Canada. The land where they make everything technical. Some of the best bands from this land are the ones that seamlessly merge technicality into sub genres of metal that are usually deemed simple and straight forward. And most of the technical bands this country produces, sound unique and end up becoming pioneers of sorts. They did it to thrash metal, death metal and to an extent, even to power metal. Now it's time for grindcore to receive some technical Canadian treatment at the hands of four lads from Calgary, Alberta. 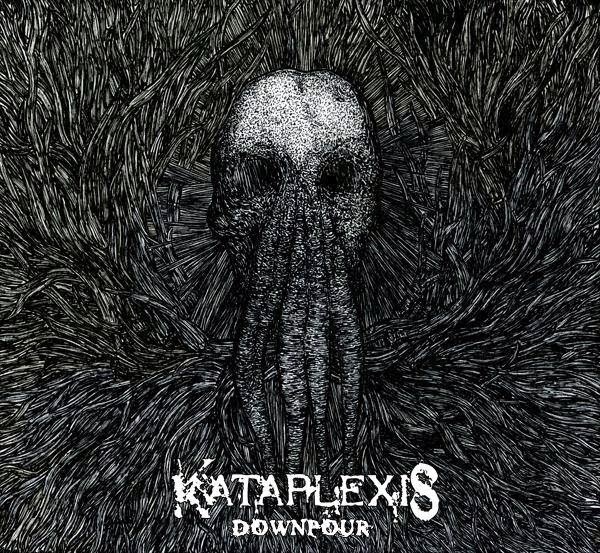 Kataplexis is a band that manages to take one of the harshest and most mindlessly brutal genres and infuse some fine technical death metal styled riffs into it. And yes, this is not something entirely new and it has been done before by bands in the past. But here, the music stays on that fine line between technical death metal and grindcore, making the union seem like it was meant to be. 'Downpour' is the band's second album and it will be released on the 11th of January, 2014 on Galy Records. The band wastes no time on pointless introductions and straight off the bat, they unleash the insanity with the track 'Bottom Feeder'. The music is predominantly grindcore with harsh and heavy riffs. The technical licks are infused into this grindcore sound, in a manner that seems so fluid and not contrived in the least bit. The problem with many technical bands these days is that, in the pursuit to achieve technical brilliance, a certain aspect called memorability is lost in the equation. Fortunately for Kataplexis, the amount of hooks and grooves they include in their song writing, make sure that the songs are as memorable as they are technical. The guitar work of Erik Anderson and Jordan Schritt form the heart of the band and any knowledgeable metalhead would know that strong guitars alone do not make up a good band. One thing essential to any technical band is a capable drummer who can keep up with the pace changes while not compromising on the technicality of it all. Kataplexis has found all that in the more than capable drumming of Dave Callahan. The band is given its voice by Aaron Mayes and he has a pretty decent range. He shrieks and growls throughout the record and his harsh tone sits comfortably within all the chaos that goes on. I saved the bass for the last because this is a section that can be improved on. While Jamie McIsaac's bass work manages to provide a solid foundation for the other elements, it lacks in individuality. The band retains the grindcore song lengths and keeps them short. However, the amount of technical riffs they put into each song makes them sound longer than they actually are. The production leaves room for all elements to be heard and the heaviness in the sound is retained. The music sounds very powerful and it manages to make an impact upon the listener. This album is brilliant but not exactly perfect. There are a few areas that can be improved upon. Nonetheless, 'Downpour' is a solid effort from these lads and is well worth adding to your collection. Hell! This is so bloody good man! Thanks for finally making me listen to this.